Zelda was a cultural icon, with countless fans and admirers coming to greet her at parties and nightclubs throughout our great city, and never showed a hint of her 95 years as she would make her way through the nightlife scene. 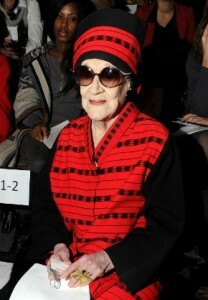 The subject of countless newspaper and magazine profiles, Ms. Kaplan was introduced beyond her NYC stomping grounds in the 2003 HBO Documentary, “Her Name Is Zelda.” While recognized locally as a social butterfly, her influence reached across the world with humanitarian efforts in Africa and Southeast Asia. Her global attitude was obvious in her remarkable and recognizable sense of style, designing her own wardrobe in bold African prints purchased from local weavers during her various trips, completing the ensemble with oversized glasses and one of her many matching toques. Born Zelda Berkowitz in Flemington, NJ on June 20, 1916, Ms. Kaplan found her way to the city after her divorce from Dr. Samuel Kaplan in the late 60’s. Her love of dancing led her to become a ballroom dance instructor, and she could often be found at parties demonstrating the fox trot and other dance standards. Later living largely off family inheritance and investments, she began to travel the world in search of the elements that made up her unique style while also spreading humanitarian efforts through the World Culture Society, the organization she both founded and financed. All of us at Metronome Hospitality Group celebrate the life of Ms. Kaplan, while mourning the loss of such a wonderful and dynamic individual. She was not an uncommon sight at Providence, our venue in the same building that Ms. Kaplan called home, and a number of our employees have fond memories of meeting her and witnessing the near aura of her brilliant presence. Rest in Peace, Zelda. We will miss you dearly.